Yesterday was my last day at the Davron Hotel and Rosehearty was bathed in sunlight so when I set out I was confident that I would have a good stab at taking in most if not all of the remaining castles on the trail. 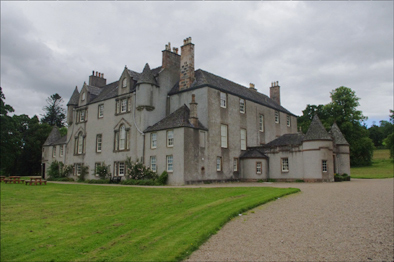 My first stop was Leith Hall which like some of the previous structures on the list looked more like a manor house than a castle. 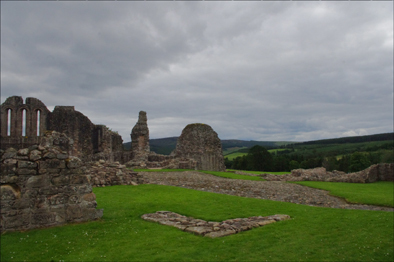 I stopped to take photographs of the outside and then moved on to the next on the list, Kildrummy Castle. Here I met the same lady steward who sold me the guide at Tolquhon Castle. She told me that she had a roving remit from the Scottish tourist board to fill in whenever there was a staff shortage. This time she failed to sell me a guide but she did tell me that I would see some wonderful views once I walked up the hill to the castle site and she was right. A plaque on the site of the Great Hall told me that the castle was besieged by the English in 1306 during which Osbourne, the blacksmith, treacherously set fire to the grain store, forcing Sir Neil Bruce, Robert Bruce’s brother, to surrender. After Kildrummy I came to Corgarff Castle which is described on the trail guide as an isolated Tower House and it is certainly isolated being the only building at the top of a steep hill. 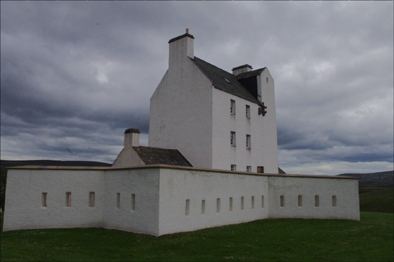 The trail guide says that after the Battle of Culloden it became a British Redcoat garrison in order to repress jacobite activity. At the bottom of the hill a sign informed me that the castle was closed for lunch but I climbed up there anyway to photograph the exterior and also to get some pictures of some of the stunning views that could be seen from the top. 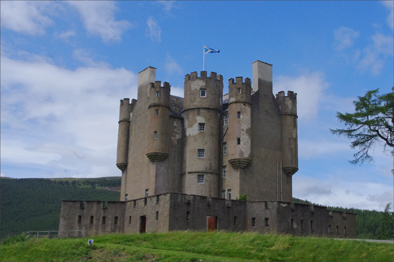 I drove on to Braemar castle. On the way my Sat. Nav. kept telling me that there were traffic disruptions on route and wanted to take me down some rough farm tracks when there was hardly another vehicle to be seen on the road. I ignored this advice and followed the sign posts until I came to this Hollywood impression of a quintessential castle. 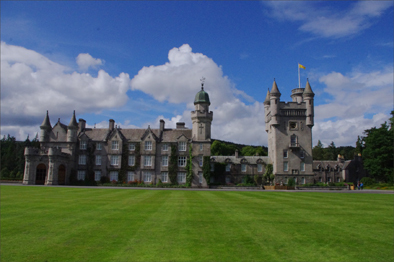 A little further along the Dee Valley is Balmoral Castle. It is astounding that it is still sometimes inhabited by actual Queens, Princes, and probably in the future by a King. I have to confess that I am not a fan of the British Royal Family and would not have gone out of the way to visit it if it had not been on the list. 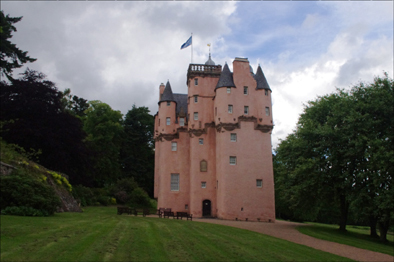 At five o’clock in the evening I came to Craigievar Castle and the end of the trail. It is a pretty pink and more like a creation of Walt Disney than a fortification built by barons in the 1600s. And so I reached the end of the trail. I had mistakenly thought I would complete it in a single day but in the end it has taken five. If I had entered every property on show and taken a guided tour I would have probably had to add at least another two. The trail is very worth following as the rolling countryside and the forests that I passed through between each castle were spectacular. The journey was worth it for these panoramic views alone.